Thermal Strain Free Assemble without thermal treatment process is thermal strain free inside the window material and can do high precision measurement. Breakage Prevention Mechanism Window Materials have erasticity, therefore, it, is, durable against cracks and leak by unbalanced fasten by flange bolts. Pressure Resistant Structure Pressure Resistant Structure : Even Pressure of chamber side is stronger than at mosphere side, window material is not off and not to leak. 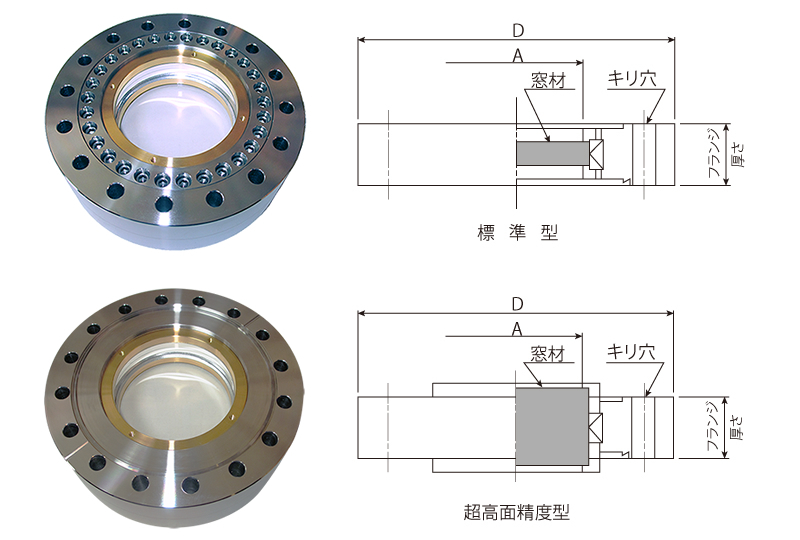 Castom-made available Super big caliber, high pressure for inside pressure or outside pressure, high precision polished, convex or concave lens, special flange and so on. Only one in the world with high performance!! Available more than phi 440mm effective diameter!! You can also use it as counter pressure. Available ultra hlgh performance flatness in more than 90% area. Lamda/20 (lamda=633nm) is also possible. 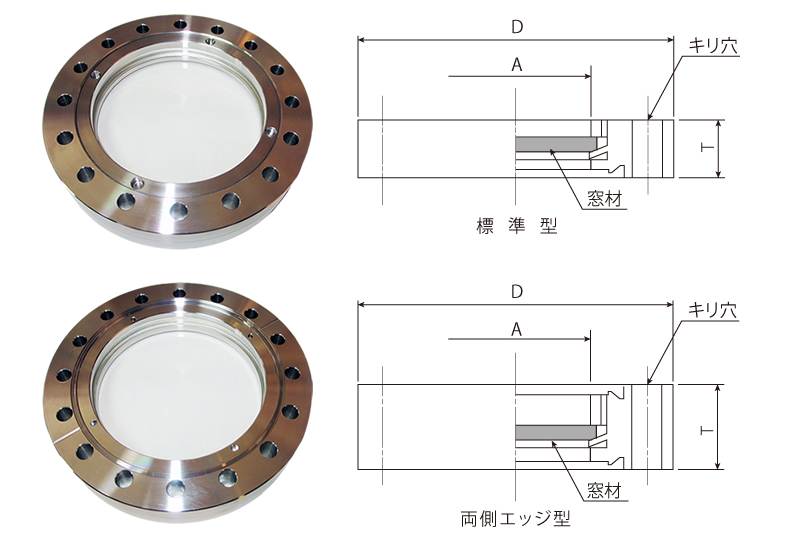 Attention, the flange size may be limited.Please contact us. Available re-polish and re-place (in our lab)!! Transmlttance without polarization and dispersion, due to own material of special sealing technique free from heat assembling process. full unlformity optical coating without any irregularity!! As you know the kovar material has strong magnetic and activation. We don't use any kovar material, so you can use our flanges in magnetic field and radiation field, too. No pollution in your chamber because we don't use any solder junction!! As you know Zn is high vapor pressure metal. If flanges contain Zn solder junction, they can not be baked. XYZ/15G/3000cycle, O.K. tested in Japan Atomic Energy Agency. Possible to bake our flange in spite of Large-dlameter!! Because our flange automatically compensates heat expansion difference. Attention, forced cooling may be applied. Copyright© 2015 Fuji Ideck, Inc. All right reserved.